A small Laboratory, with shelves of books and laboratory instruments, tiny glass bottles full of chemicals with labels, a tiny desk with microscopes, racks of test tubes, miniature slides of various bacteria and viruses and bits of nature. There is also a side workbench with two more microscopes, bottles of chemicals and more slides and test tubes. There are a few pieces of very small scientific glassware like alembics (which resemble a 3-D glass apostrophe) and beakers and jars. 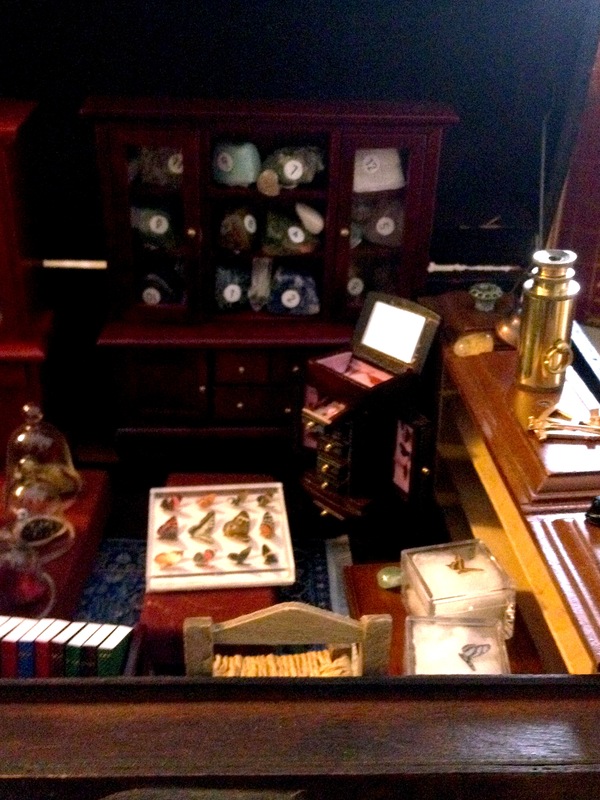 A small Natural History Specimen Room evoking the great cabinets of curiosity from the 17th century, including cabinets of shells, cupboards full of minerals, a small chest with wing panels and drawers that has miniature butterflies, and a tiny chest of drawers with compartments for specimens of eggs, shells, and various gems and minerals. The furniture is mostly repurposed mahogany cabinets that might be found in an antique dollhouse, all with drawers that open and reveal interesting minute things. The Specimen Room also includes a series of pedestal displays, miniature mahogany stained pedestals with glass bell-jar covers, that include nests and birds and shells. 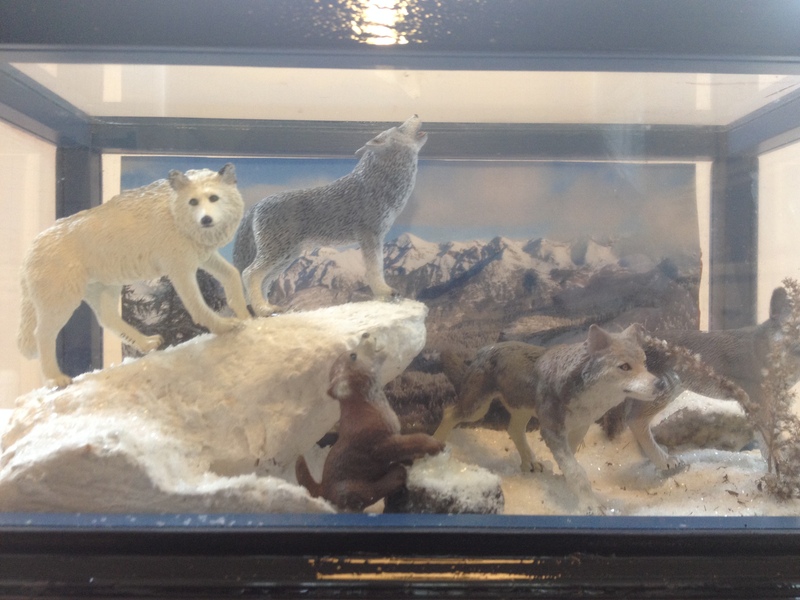 A Series of Small Scale Diorama Displays of Various Animals of the world in their natural habitats inside wooden and glass display boxes. Using the detailed and realistic Schleich animals, each creature is shown with a natural background and foliage to simulate their native environment. 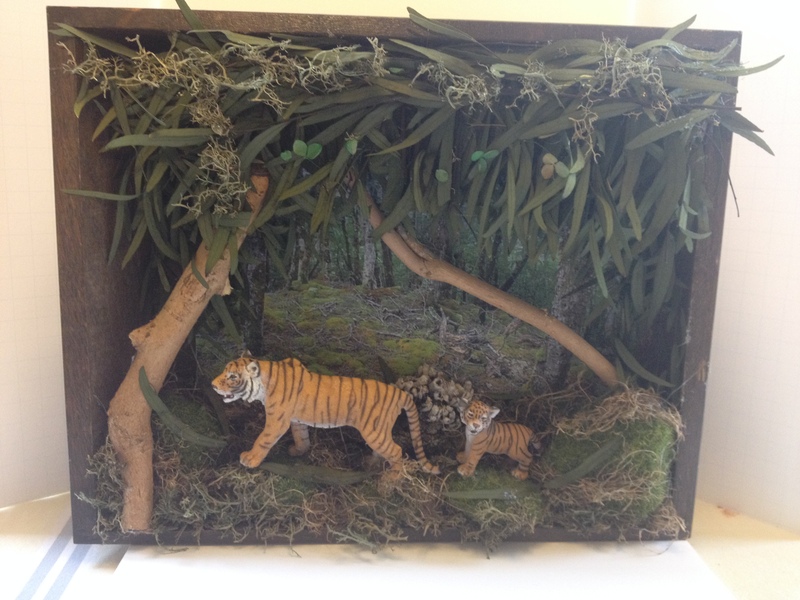 To date, the dioramas include: Bengal tigers, North American Wolves, Chinese Panda, European Red Deer, and an Owl and Squirrel in a forest setting. In progress and nearly complete is a Squirrel’s underground den, a large Serengeti display in an aquarium-size diorama including Elephants, Zebras, Hippos, Meerkats, and Giraffes. Also in progress are: North American White-tailed Deer, a Black Bear near a waterfall, a tense meet-up of an American Badger and Wolverine, an English Badger and its cubs near in its log den, Raccoons, Hedgehogs, Squirrels, a Wild Boar, European Roe-Deer, and Polar Bears. 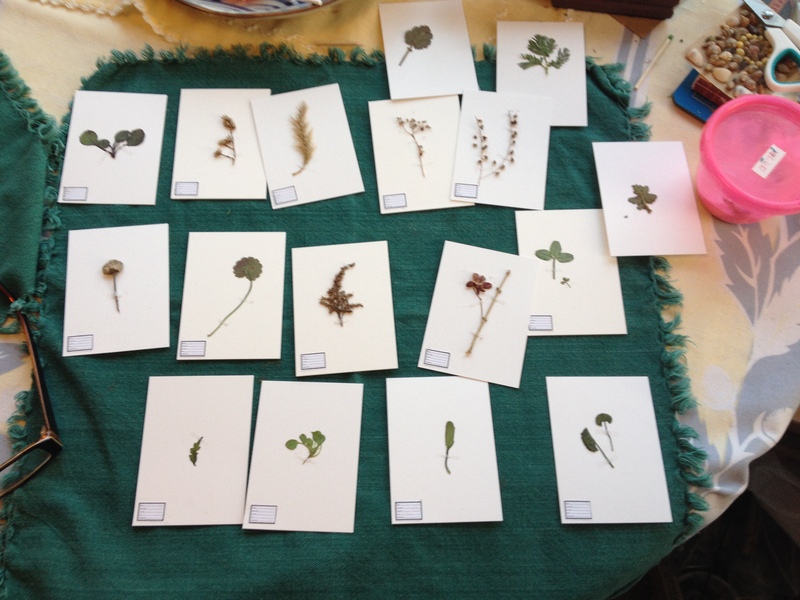 A Miniature Herbarium of Pressed Plants, following in the footsteps of the great botanists and also literary amateurs like Jean Jacques Rousseau and Emily Dickenson, tiny plants have been pressed, then glued to artist trading cards with small vellum straps keeping them secure. 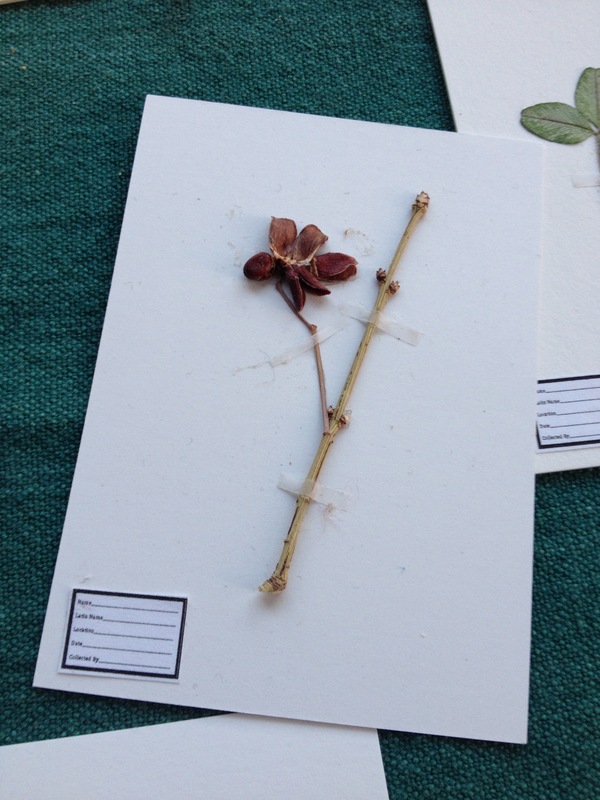 The plants are all being identified as to where they were collected, and as much information about them as can be verified. They are kept in a wooden box and pulled out for viewing and comparison. A Repository of Miniature Historical Scientific Images and Maps from the era of the great Cabinets of Curiosities to the 20th century. From the earliest drawings of the cosmos and stars, medieval and renaissance depictions of animals and plant life, to twentieth century diagrams and inventions, the reproductions have been reduced in size to miniature scale. Some are on artist trading cards as display items, others are inside small leather books and include the great nature paintings of Albrecht Dürer. There are also Displays on Aspects of Science and Math, such as the Chladni device using a miniature violin bow that creates patterns in sand when drawn across a glass plate. 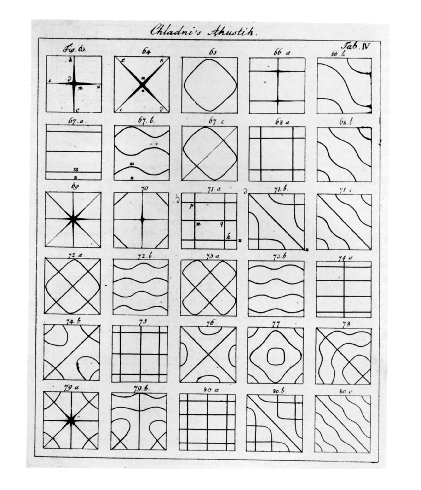 Based on the 18th Century invention by Ernst Chladni, the patterns in sand were then studied by various mathematicians, most significantly the great French math expert, Sophie Germain. 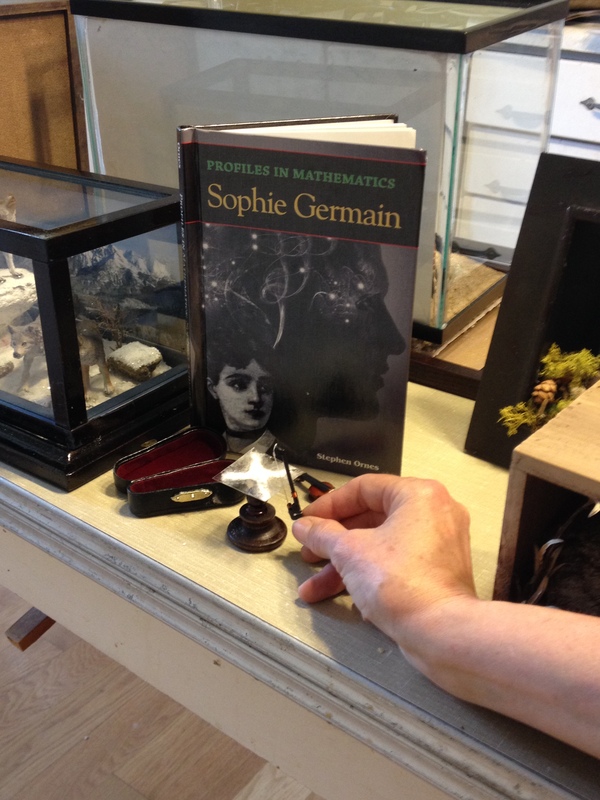 Germain’s curiosity about nature and math are an undercurrent of the project, and she is one of several women thinkers included in a ‘Pantheon of greats’ who had to struggle to have their ideas heard. Germain was only able to obtain an education, publish her work, and gain recognition by using a man’s name in early 19th Century France. This section of the Museum also includes miniature technological devices, such as the ‘internal workings of the music box’ display. The idea for the Museum began with Debra Pughe, who was writing a novel where a group of young girls, all boarding school students at the International School in Geneva, decide to make their own miniature museum and hide it inside suitcases underneath their beds. The girls are all smart and ambitious, each with animals they are fond of, and since the School is near the Natural History Museum in Geneva, they get the idea to create their own in small scale. It is entirely their own project and design, and much of the fun is in finding things to use to show it (the cigar boxes and cabinets and aquariums) and scouring for or making bits of nature that resemble larger specimens. Their project comes about with a lot of fun and perhaps without the exactitude of their school lessons. Mistakes are made, but so are discoveries and most of all their friendships grow through all these explorations. The novel is called The Country Where I Solved My Discontent, and was finished in the Spring of 2016. From this idea, Debra began to collect all the things she was writing about and realized her writing friend Emily Buck, who was 12 (in 2012), was also working on a novel about the natural world. 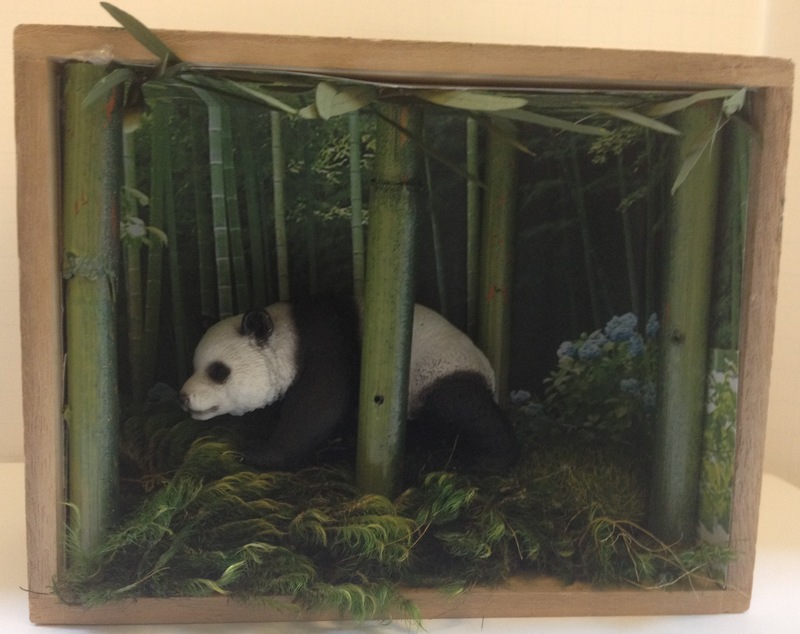 As an avid collector of Schleich Animals, Emily was the perfect person to help make the Dioramas. Emily, a masterful writer, artist, and accomplished violinist, then mentioned her friend Angie Zirbes, who was 13 then, and an artist working on a graphic novel as well as being a musician. Both girls were enthusiastic about making dioramas, and they were soon joined by Xin Xu, a microbiology junior at University of Iowa who saw the miniature laboratory and asked to help. Xin was planning on a career in pharmacology and is interested in the natural world. She said she missed working on craft projects since she left Guangzhou several years ago. Through as series of weekend sessions making the Dioramas, the group began to plan how the Museum could be used in teaching. Debra refers to their group as Diorama Divas and part of the fun of getting together each week is going out into nature looking for samples and specimens, or for bits that could resemble miniature things. They regularly takes Mr. Dog and sometimes Ginger, Emily’s dog, with them on their nature walks. So far, Debra is funding the project materials with the idea that the entire Museum would eventually be donated to the appropriate Natural History Museum or the Children’s Museum. When it is finished there is the hope that it could travel around to schools, libraries and museums and that kids could enjoy opening the tiny drawers, looking through the pressed plants, viewing the dioramas, and that it could stimulate discussion about the environment and also may inspire other kids to create their own miniature worlds. Because of the current emphasis on STEM education: Science, Technology, Engineering and Math, there is a role the Miniature Museum could play in interesting young people in new approaches to science. Girls in particular who are interested in miniature worlds have responded enthusiastically to what they have been shown so far. 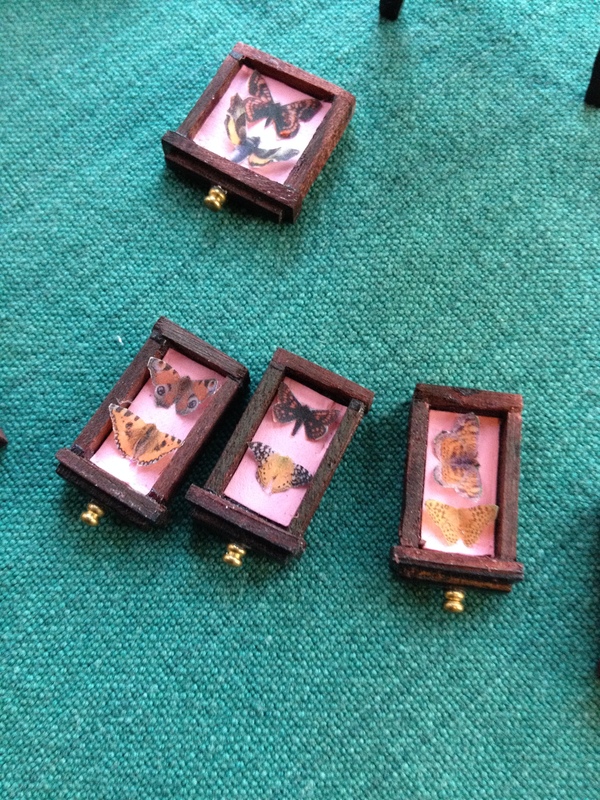 And because collecting live specimens— butterflies, insects and birds — is no longer condoned or practiced, there is a way that creating them in miniature requires an extra dimension of observation. It is also a way of looking at and simulating bits of nature that does not hurt any living beings, apart from the plants. Combined with an interest in nature is a concern for the environment; the Miniature Museum will have small didactics that discuss the way habitats are changing and what can be done to try to preserve the health of the planet. To see more photos of the Museum and its progress, check out our earlier blog posts, including some about the Micro-Miniature Museum. Thanks for coming by!